ZANESVILLE, Ohio – It was a morning filled with bowling and good company at the Sunrise Strikes bowling alley. 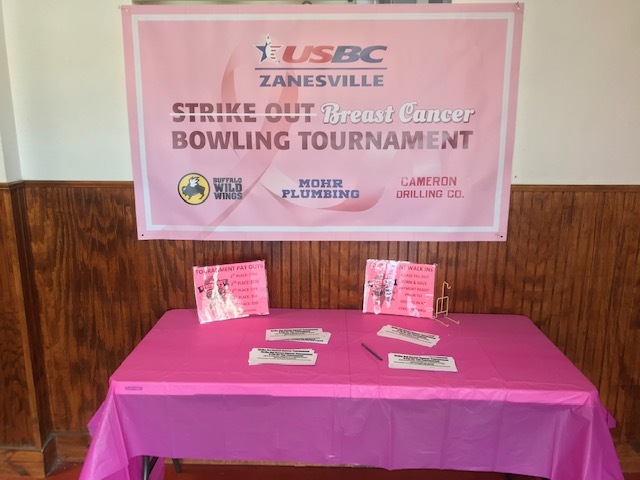 Saturday, February 9th was the 3rd Annual Strike Out Breast Cancer Tournament that the Zanesville USBC hosted. The purpose of the event is to celebrate those who have survived breast cancer and honor those who have not. Hildenbrand said this event is her way of giving back to the community and supporting others who are going through what she has experienced. There was a cash prize for the winner of the tournament as well as other games and a silent auction to participate in. “Some fun bowling, yes there is prize money but it’s a fun time and just fellowship. We have ball raffles, we have 50/50,” Hildenbrand said. This event has been an emotional journey for Hildenbrand because when this event first began she was going through the experience of chemo and fighting breast cancer. All of the proceeds raised at the event will be donated to the Zanesville Cancer Center.